This campground is a little ways off I-64. We were assigned site 57 which appeared to be for semi-permanent campers. The site was a bit of a chore, but not too much, in backing my 32' 5th wheel into the site because of a raised fire pit across the road from the site, a tree on the site, and the raised patio. The site was small in width for slides as we felt we were encroaching on our neighbors front yard and picnic table. Had 50 amp service wire water, sewage and wifi...all worked well except wifi was weak. Many semi-permanent campers here that had fixed steps and sewage connections. Small site not able to park vehicle on site with a 25 ft. travel trailer. if you are a one nighter see if they will give you a site so you don't have to completely unhook or park your vehicle off site.. Cable hook up not working. iffy WIfi. Live ins mixed in with travelers . Do not use GPS or take Country LN. you will be in the wrong place with limited turnaround. Not mentioned on their web site. Very clean bathrooms. As usual pull through sites saved for the big boys. Great camp ground. Many new improvements going in. Beautiful new bathrooms, with individual showers. Inground pool being installed. Nestled in the woods near a creek. Camp sites are a little close together. All in all I would come back again, and again. Large Class A- Well.... lets just say it's not what we expected. We reserved for more than two weeks, I asked for a nice spot since we have people visiting us here during the daytime. They assigned us the smallest of the very small full hook up space. They were nice about switching it when I asked to move. We literally would have been right up against our neighbors slides when sitting at our picnic table. Still, in the new site, I can hear my neighbors TV and look down onto them sitting on their deck. The pool is being repaired, so it's not open (it's spring break). The "general store" looks like a storage bin, not much there but stacked benches, etc. Our premium site backs up to a RV storage lot. Looks nothing like the pictures on their website, and the mini-golf costs $1 per game- cost is left off their website. Too much money for the value at $38 per night. Although this campground is off the beaten path it has the feel of a city campground. There are many full-time RV's here. If you want some space and privacy choose a water/electric site along the creek. The full hookup sites are really tight; better hope you get a good neighbor. The facility is clean and well-maintained. 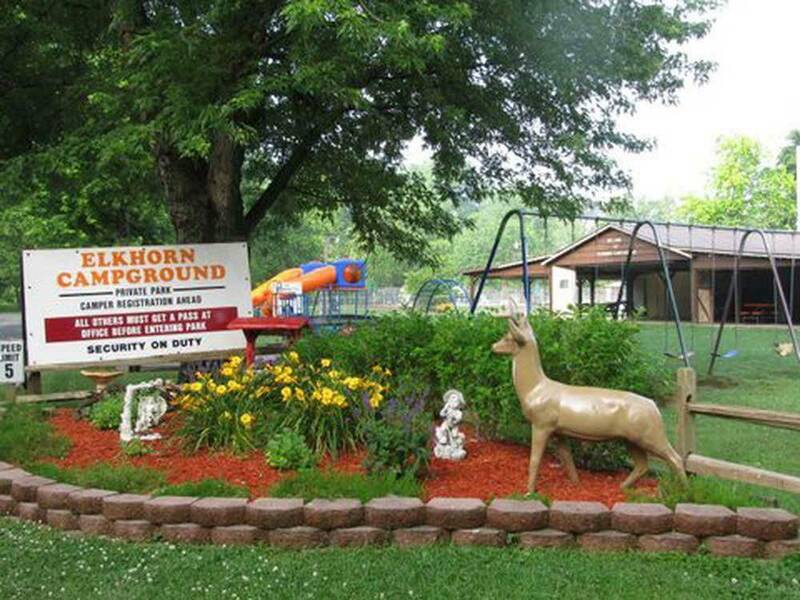 We just returned from the Kentucky Bourbon Trail and while in Frankfort, Kentucky we stayed at Elkhorn Campground. I highly recommend this campground. Super family/pet friendly and very clean and peaceful. We'll definitely stay here again. Stayed two nights in a 40 foot motorhome. No pull through sites, and getting backed in took some help from neighbors and moving of trucks parked directly in front of our site. Other than that the stay was good. Nice concrete pads with picnic tables and a fire ring. Sites are close together, the people were super nice, so no problem. Do not get to see the store and office as they had just poured a new concrete porch. The shower and bath was excellent and very clean. Grandchildren loved the playground and basketball court. Next time we will have to stay longer. This park is on a river. Spaces are close together but are shaded by tall trees. We loved the peaceful sight of being camped along side the river. Small convenience store, kiddy playground and dog friendly. Close to the town. Oh my! Nice park, great staff, good sites. Welcomed with open arms and enjoyed the stay. Cable TV was excellent. Internet strong. Best park in the area. Even though the weather didn't cooperate very well, our experience with the campground personnel and other campers was very positive. We plan on going back. What a great place! Well maintained with nice creekside sites available and an all around good family feel! Pool and bathhouse very well kept! Lots of room to walk your pets and even ride a bike! Everyone was very friendly and will look forward to coming back again!! We stayed one night at Elkhorn while traveling to Atlanta. 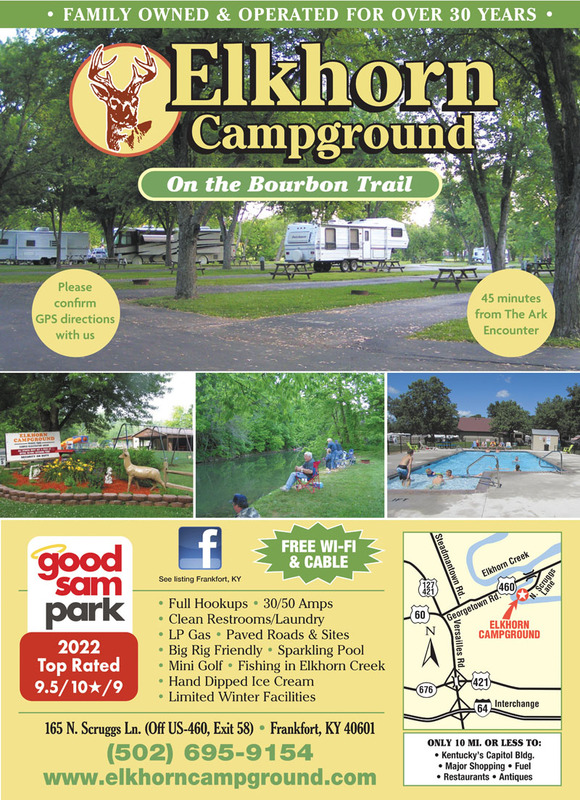 The campground was close to an area with numerous restaurants. Elkhorn was very clean and well laid out. The hook-ups at our back-in site were grouped for 4 adjacent sites, so that 2 of the 4 site's runs would have to go to the far side of their RVs, which could make the runs long. The staff was efficient and couldn't have been more helpful. We left something behind at our site when departing and the neighbors found it. The staff gave them our cell number so they could arrange to return it to us. In fact, a package was shipped to us right from the campground office. We will definitely stop by there again. This place was way over rated on Good Sam. It has and old, used look to it. Sites are vey small, with full hook up sites backed right up to each other. Our site was not level. Had to unhook truck and park sideways on grass to get off road. When unhooking or hooking up, truck had to be half way in road. WiFi is weak as is typical of many parks. Cable wouldn't work on our new trailer, but office staff sent someone who hooked up a box that fixed the issue. There are many long term RV's here with all the "stuff" that entails. During the past month, my husband and I have camped from SC to the Tetons and Elkhorn Campground is by far the best campground we have stayed in. Last night was our last camp for this trip as we head for home today. Thank you, owners and staff, for your beautiful, spacious lots, the serene setting, and your friendly assistance. Your beautiful camp helped us end our trip on a very positive note. We definitely will come back here if we are traveling this way. From jct of I-64 (exit 58) & US 60: Go 2-3/4 mi N on US 60, then 2-1/4 mi E on US 460, then 1/4 mi S on N Scruggs Ln, then 1/4 mi S on McConnel Rd (E).